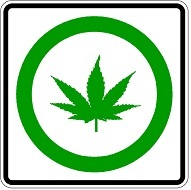 Legal Marijuana symbol. (Standard Reflective on .080 gauge aluminum). Now available for use in Colorado and Washington. May be used with Arrow sign, D9-2a.